I’ve always been a big fan of freezer cooking, but since having a baby, it’s become an even bigger part of my cooking routine. Every Sunday, I spend most of the day cooking meals for the week. Some of it goes in the fridge and the rest is packed up and put in the freezer for later. Cooking once a week, instead of daily, is so much easier. Dinner is done faster, there are fewer pots and pans to wash during the week, and the kitchen doesn’t need to be cleaned up after every meal. Even if you normally have time to cook dinner on weekdays, it can be harder during this time of year. You’re pushed and pulled in so many directions—holiday parties! Christmas shopping! decorating!—and making sure you have dinner on the table at a reasonable hour every night starts falling lower and lower on your priority list. Takeout and store-bought frozen meals can start to add up, so taking a little time out to prepare some freezer meals is the perfect way to have dinners on hand and ready-to-go without adding to all those other holiday expenses. 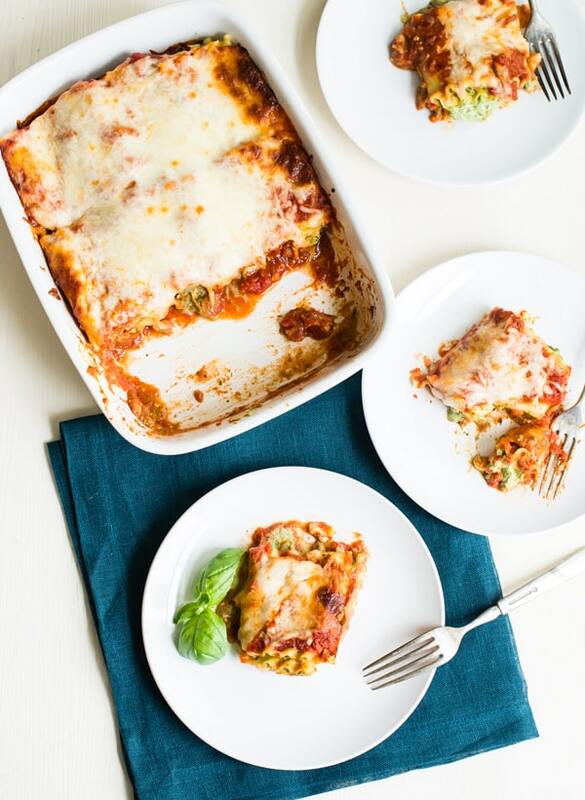 These Pesto Lasagna Roll-Ups from our Oh My Veggies Guide to Freezer Cooking are an easy dinner to make and freeze. It’s one of over 30 tester-approved vegetarian freezer recipes included in the ebook, along with hints and tips to get you started on your own freezer cooking adventures. A make-and-freezer dinner from The Oh My Veggies Guide to Freezer Cooking. Stir together the pesto and ricotta in a medium bowl. Add salt and pepper to taste, if needed. (You might not need any!) Stir in the egg. Lay out all 12 lasagna noodles on a clean working surface (like a cutting board). Blot them dry with paper towels so the cheese filling doesn’t get watery. Spread the ricotta mixture onto each of the noodles, leaving a 1/2-inch margin at one end. Sprinkle the Parmesan cheese over the ricotta filling, then roll up your lasagna, rolling towards the end with the 1/2-inch margin. Spread 1/2 cup of marinara sauce in the bottom of a small freezer-safe baking dish that’s been sprayed with oil or cooking spray. Transfer the roll-ups to the dish, then pour the remaining sauce on top. Sprinkle with the mozzarella cheese. Cool the casserole completely. Place a layer of plastic wrap over the top, then securely cover the dish with foil (or the lid of the baking dish, if it has one). Transfer the baking dish to the freezer. Thaw the casserole for 24-48 hours in refrigerator, or remove the foil and plastic wrap and thaw in the microwave. Once the casserole has thawed, cover it with foil and bake it at 350ºF for 30-45 minutes (until it’s warm, but not hot, in the center), then remove the foil and bake until heated through and just beginning to brown on top, about 15 minutes more. While some freezer cooking recipes do have to be baked and then frozen (particularly if they use fresh vegetables because unless they’re blanched first, they won’t freeze well), this particular one does not. So you’d assemble, wait for it to cool (only necessary if the noodles are still hot), then pop it in the freezer. This looks delicious! I have a hard time getting my son to eat veggies sometimes but he loves pasta dishes. He’ll enjoy this.